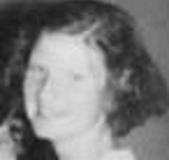 Medical Conditions Elsie may have been pregnant at the time of her disappearance. Distinguishing Characteristics Caucasian female. Brown hair, blue eyes. Elsie may wear eyeglasses. Elsie was last seen by a police officer in West Point, Virginia at 11:00 p.m. on May 20, 1957. She was walking down the street, carrying two suitcases, at the time. She has never been heard from again. Elsie was finishing her sophomore year at West Point High School when she went missing; she was an above-average student. At the time of her disappearance, she lived with her adoptive father on Fifth Street; her mother had died two years previously. Her father didn't realize she was missing for some time because he worked the night shift and arrived home during school hours, when Elsie would normally have been out of the house. He reported her missing three days after she was last seen. In 2015, nearly sixty years after Elsie's 1957 disappearance, authorities announced they have a suspect in her case. They haven't publicly identified the person, but they stated he was close to Elsie's age and is still alive; they've interviewed him multiple times. Elsie's father died in 1968, but her former classmates and the community would still like to determine her fate. Elsie's case remains unsolved. Updated 2 times since October 12, 2004. Last updated July 22, 2015; two pictures and medical conditions added, details of disappearance updated.